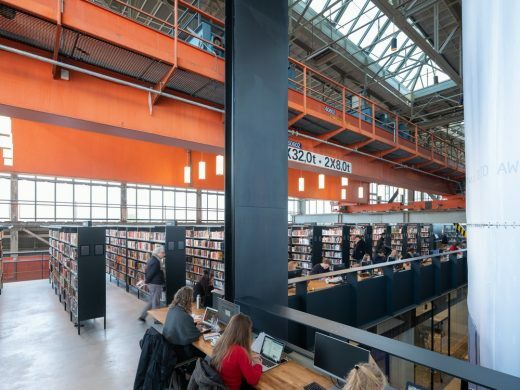 Visitors to Tilburg’s newly modernized station district will notice an exciting addition to the city: the new public library which was officially opened in January 2019. 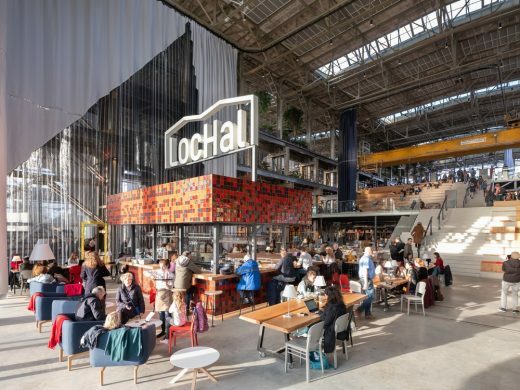 A former locomotive shed – the ‘LocHal’ – has undergone an intensive redesign to become the beating heart of the district. 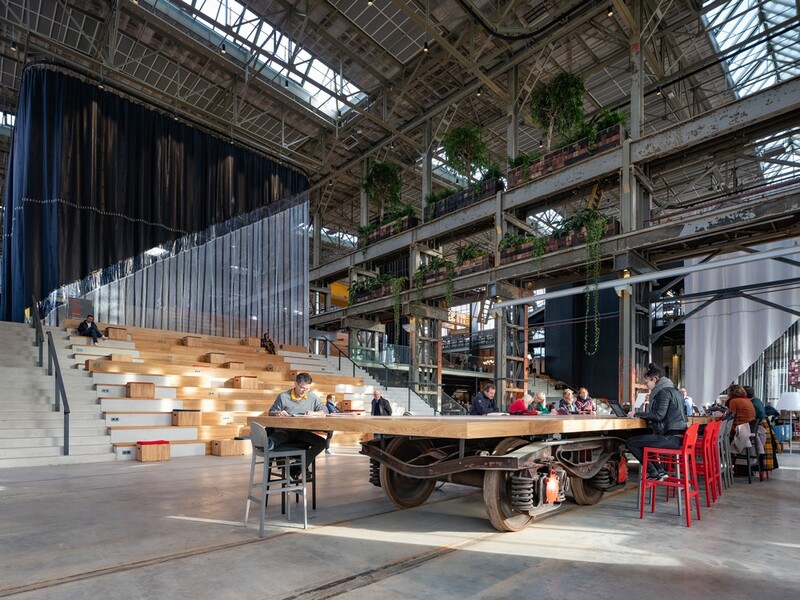 It has been transformed into a public meeting place with a distinct railway theme. Its rugged steel structure provides the perfect backdrop for all manner of events and exhibitions. Much of the elegant industrial building has been conserved. 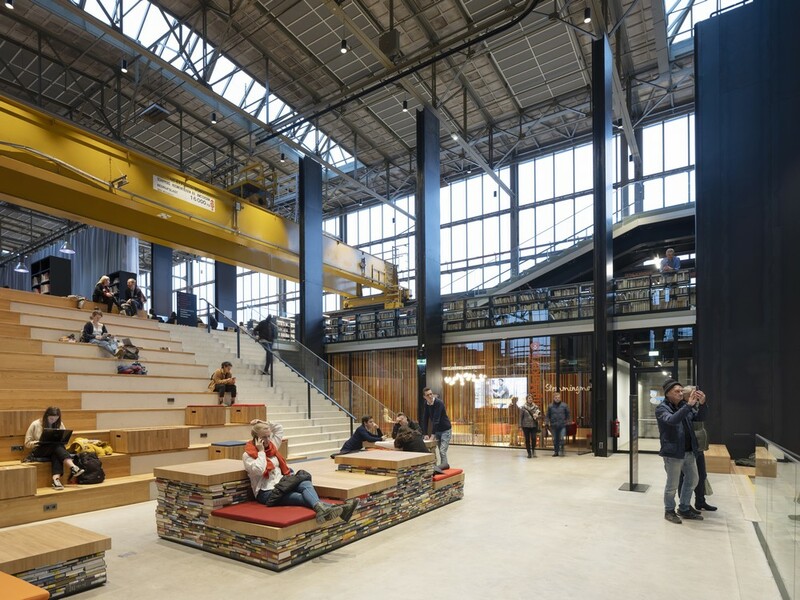 With the addition of robust new architecture and huge textile screens, it has been transformed to showcase the new concept of Midden Brabant Libraries. It is a place in which knowledge is not only ‘consumed’ but produced by partners such as the arts organization Kunstloc, Brabant C and the co-working facilities of Seats2Meet. 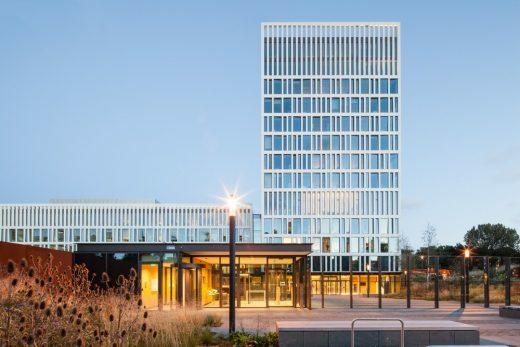 The building’s design is the result of close collaboration between Civic Architects, Braaksma & Roos Architectenbureau and Inside Outside/Petra Blaisse. 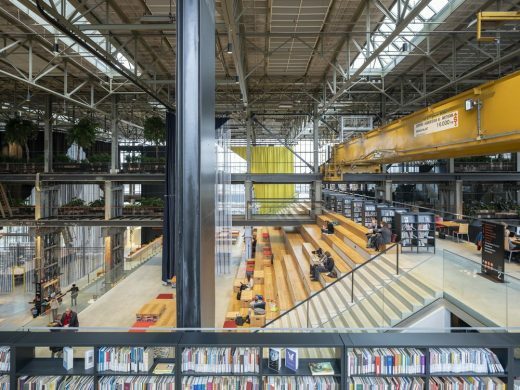 The interior design of the library, the various ‘laboratories’, the café and offices are by Mecanoo, while the engineering consultancy Arup advised on aspects such as sustainability, re-use and acoustic design. Perhaps the most conspicuous feature of the new LocHal is its sheer size. With a footprint of 90 x 60 metres and a height of 15 metres, it is both imposing and inviting. The new library was deliberately designed to be an extremely accessible building. 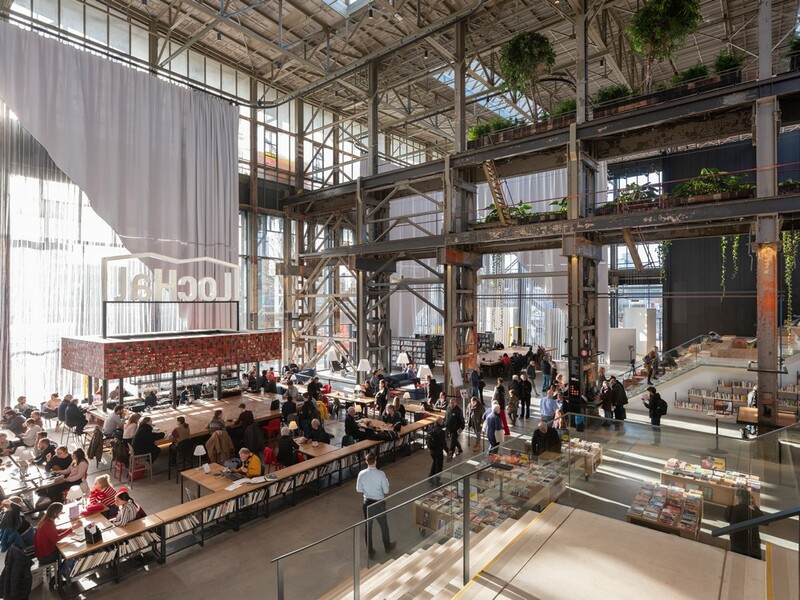 The entrance hall takes the form of a covered city square with large public reading tables (doubling as podia), an exhibition area and a coffee kiosk. This square is flanked by broad steps which can be used as event seating for over one thousand spectators. These steps lead up into the main building, notable for the huge glass facades which allow for plentiful daylight. 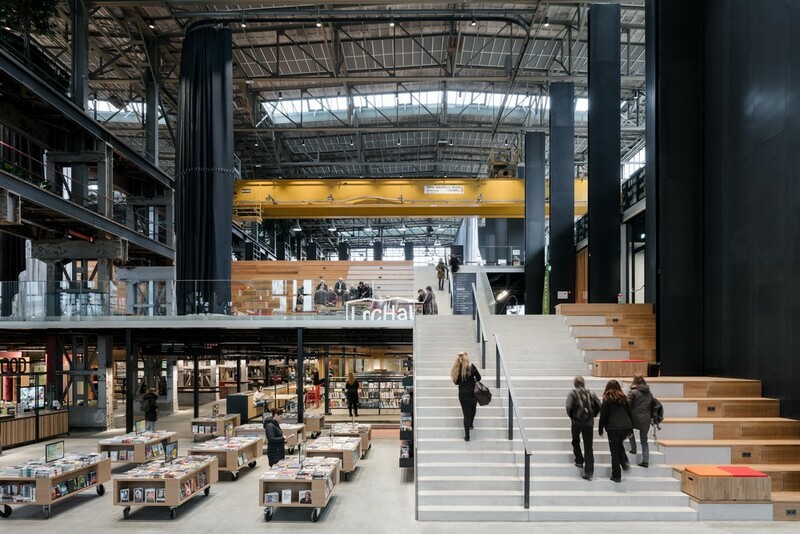 On the second floor, the gallery and stairways allow closer inspection of the historic glass walls as visitors browse the bookcases or make use of the quiet reading areas. One floor higher is a large balcony offering panoramic views of the city. The LocHal has redefined the function of a library in today’s digital era. 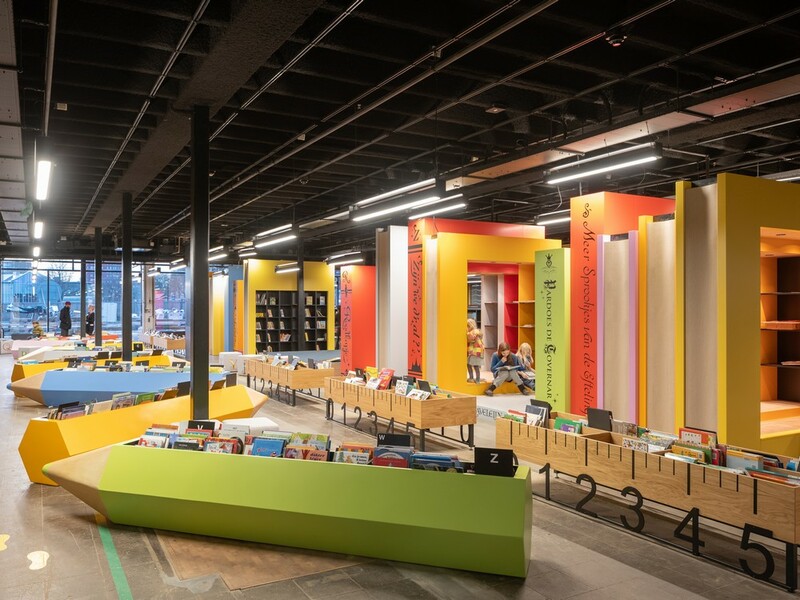 While there are the usual facilities for the traditional ‘book consumer’, the new library also provides ample opportunity for the creation of new knowledge. ‘Curatorship’ has become just as important as the books themselves: interaction with human experts offers a deeper, richer way to acquire knowledge and information. This new role is facilitated by the architecture. In addition to various areas for lectures and public events, the library has a number of ‘labs’ (laboratories) where visitors can learn new skills. These labs, with their remarkable design, can be found throughout the building. One is in the form of a glass cube, formerly part of the concert hall in Amsterdam’s Beurs van Berlage building. There is also the Food Lab, the Word Lab, the DigiLab and the Heritage Lab. The clustering of library, various arts institutes, Seats2Meet and faculties of journalism in the nearby Mindlabs (currently under construction) creates a diverse group of experts who will cement the success of the new library concept. 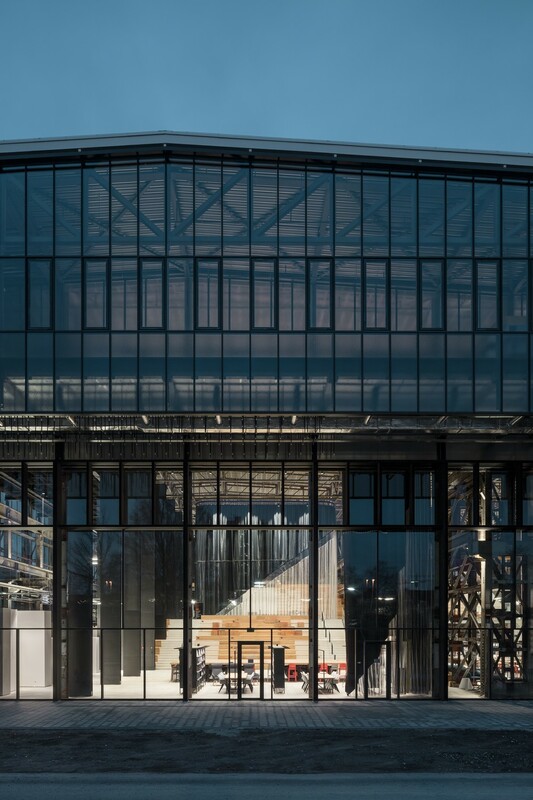 Moreover, the form of the building ensures that the collection, the facilities and the manner in which they are used can be adapted to meet changing requirements. The atmosphere of the building is that of a productive knowledge institute. 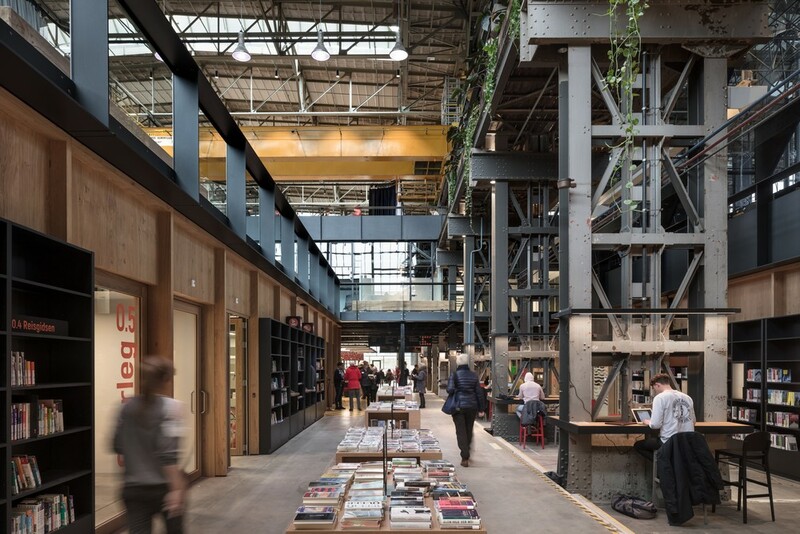 The main structure, various original features which have been carefully preserved and the new additions make use of ‘honest’ materials such as black steel, concrete, glass and wood, applied over large surfaces. Textile screens add accents of scale and colour. It is the main structure which determines the architectural language, while the details adapt themselves to the scale of the building. 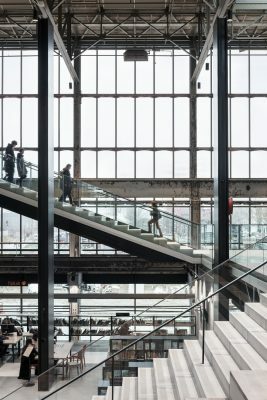 Floors, columns and stairways reveal their characteristic textures when viewed at close hand, especially in daylight when the refined shadows created by the intricate window frames and translucent textile panels play upon them. After dark, the building is turned ‘inside out’, as it were, with the interior becoming the main source of light: an inviting beacon in the city centre. The interior then takes on the character of a theatre, with all surfaces bathed in a warm light. The imperfections of the existing materials contribute much to the authentic atmosphere of the LocHal. 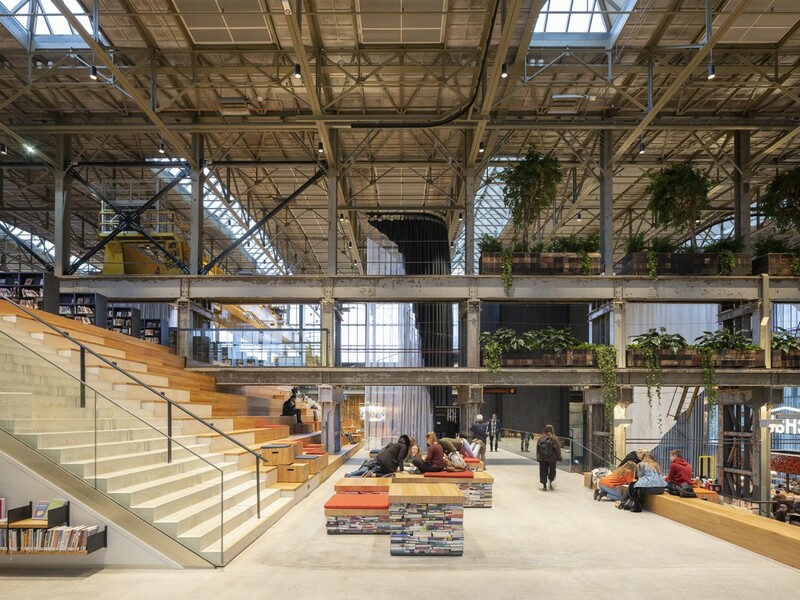 The architecture creates a colossal, industrial setting for all types of activity. The interior design, with its unique fixtures and fittings, creates an extra layer that adds playful variation to the overall visual experience. Amid all this openness, certain events and activities may call for a smaller scale or a degree of privacy. 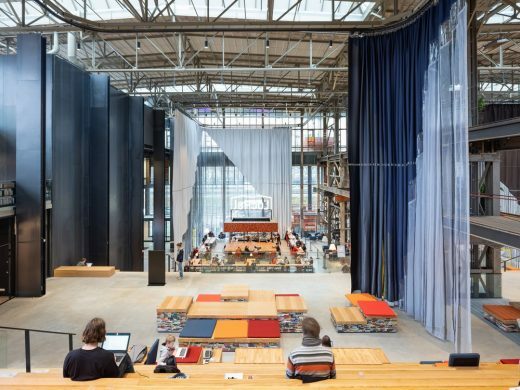 Inside Outside has therefore designed six huge textile screens which extend to ceiling height, thus accentuating the scale of the building while also defining separate areas and improving the acoustic properties of the interior. These screens have a total surface area of 4125 m2 and can be repositioned using a computerized system. They can, for example, be moved to separate the Seats2Meet area from the higher library floors, or across one of the staircases to create a small, semi-private auditorium. The largest screens, 50 metres across and 15 metres high, can be used to conceal the coffee kiosk or create the perfect backdrop for it. 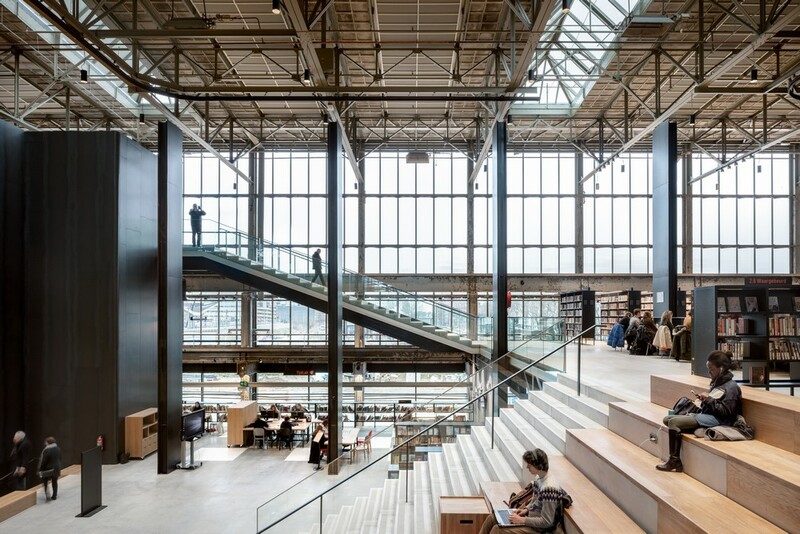 When positioned in front of the windows on the south side of the building, the screens soften the light that floods through the tall glass facades into the inner square. 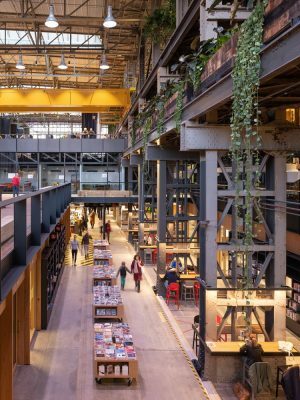 The new architectural design is a contemporary reinterpretation of that of the original late-industrial building, dating from 1932, and builds upon the logic of that design. 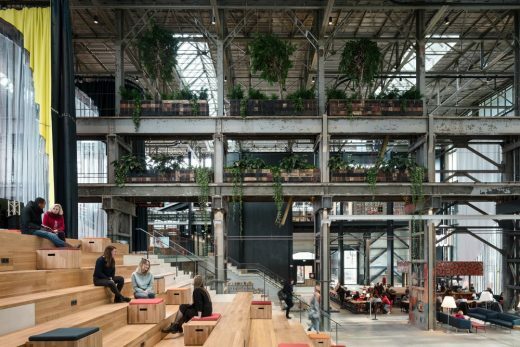 The impression of spaciousness is strengthened by new sightlines across the diagonally stepped interior landscape. 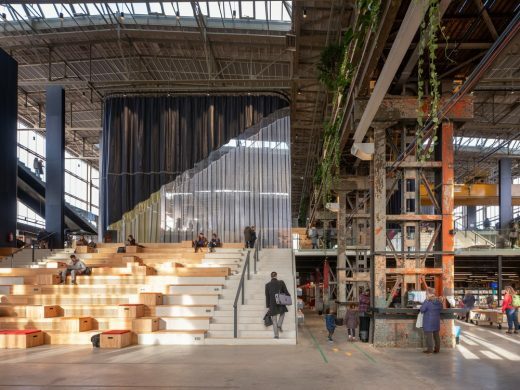 Columns, floors, balustrades and the textile screens form the ‘grand gestures’ of the various axes within the spatial system: directly up, behind and to the sides, a reference to the industrial processes of the past. The original riveted columns have been preserved and are joined by large supporting structures in a more abstract form which delineate the side aisles they create. 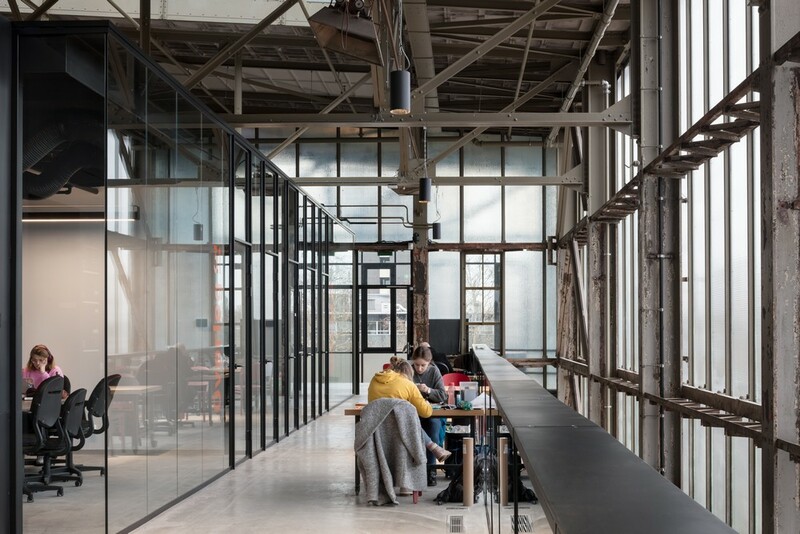 The interior design employs a number of distinct concepts to create different settings for various activities such as meeting, collaboration or quiet reading. 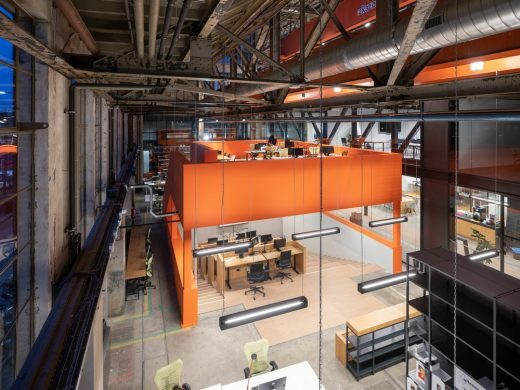 Characteristic original features have been combined with oak, steel and a palette of red and orange hues. The coffee kiosk is finished in red, brown and gold ceramic tiles. Three huge tables, designed in the form of a train’s ‘bogie’ (undercarriage), stand on the original tracks. They form an extension to the bar area but can also be pushed together to create a stage or catwalk, with the surrounding steps providing seating for the audience. The immense industrial columns have been repurposed as reading and study areas by the addition of wooden tables and lighting. The library’s collection is arranged on large, movable bookcases to create the inviting atmosphere of a modern bookstore. 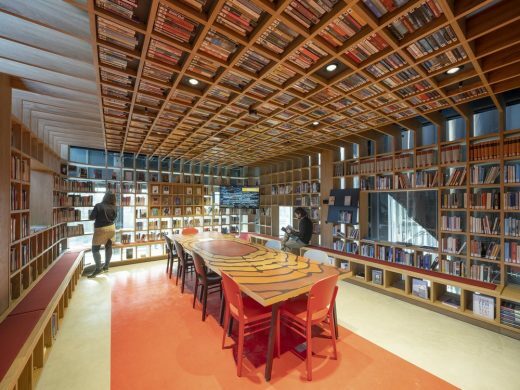 There is also a children’s library, the design of which draws inspiration from De Efteling, the fairy-tale theme park near Tilburg. Young visitors can wander through giant storybooks and browse bookcases in the form of coloured pencils and rulers. 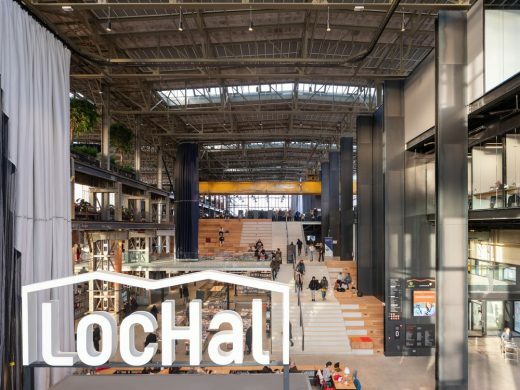 The technical aspects of the LocHal design are based on a phased approach whereby the possibilities offered by the existing building are used to the greatest extent possible and additions are made only where absolutely necessary. The result is a structure which uses the full load-bearing strength of the original floors and beams, which were after all designed to support heavy locomotives. Similar restraint underpinned the structural engineering concept and installation technology. The degree to which an area has artificial climate control depends entirely on its function, whereby the principle of ‘heat the people, not the space’ has been applied. An ingenious system of five separate climate zones ensured that physical adaptations could be kept to a minimum. It was then possible to undertake the transformation of the enormous volume of the LocHal rather than the more radical intervention of replacing it. The various design aspects are very much interdependent. A large number of companies and individuals were involved, each contributing their specific area of expertise to create a single, superlative design. The architects for the project were selected by means of a design competition and the winning entry was submitted by a partnership of three firms. 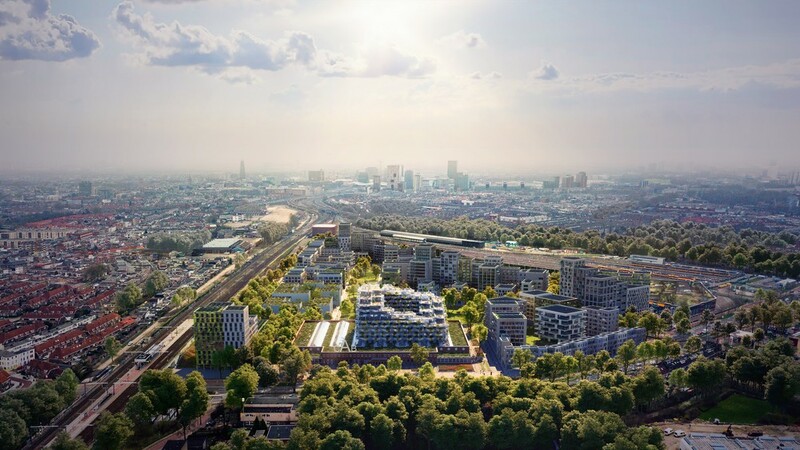 Civic Architects, a leading expert in public architecture joined forces with Braaksma & Roos (known for its expertise in the transformation of industrial heritage) and Inside-Outside/Petra Blaise, experts in interior and landscape design with extensive experience in textile-based interventions. The design team enjoyed the support of the engineering consultancy Arup. Interior fixtures and fittings in the library, the café, the laboratories and the offices were designed by Mecanoo. Inside Outside designed the six textile screens which were produced with the assistance of the Tilburg Textile Lab. 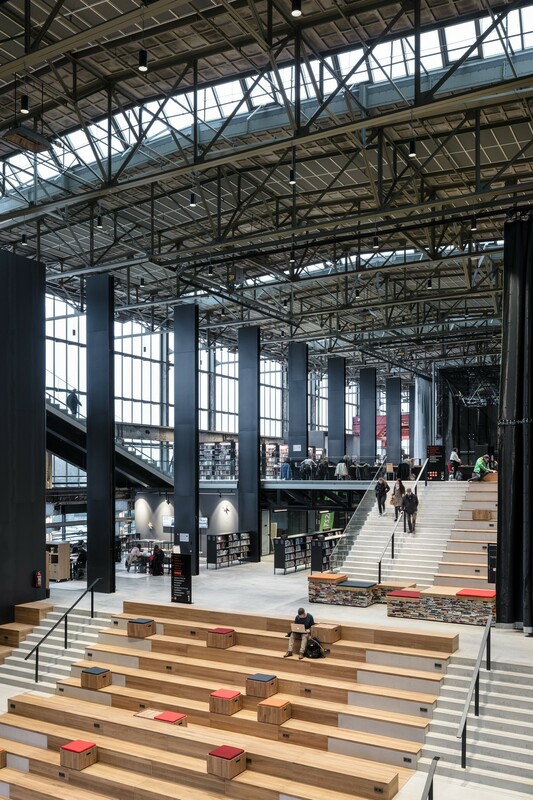 The interiors of the Seats2Meet areas were designed with the input of architecture students at Fontys University of Applied Sciences. Lead contractor for the implementation phase was Binx, working under the guidance of VDNDP Architects. 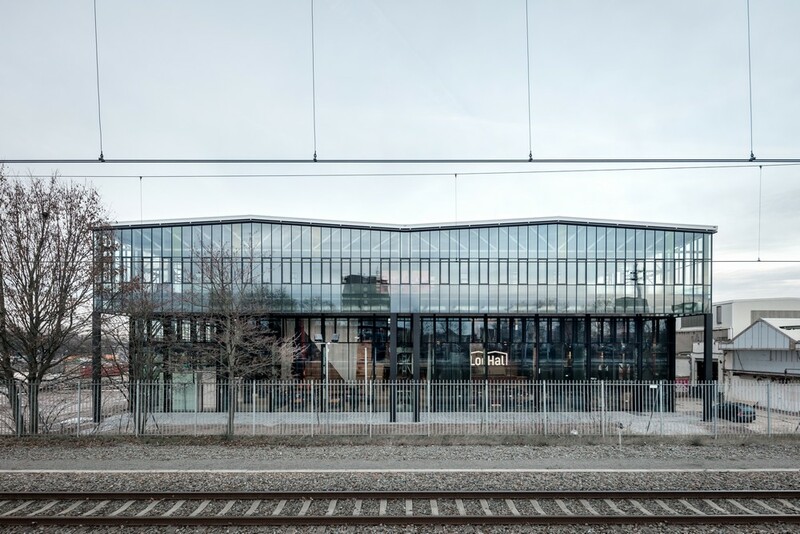 Civic Architects specializes in public buildings. 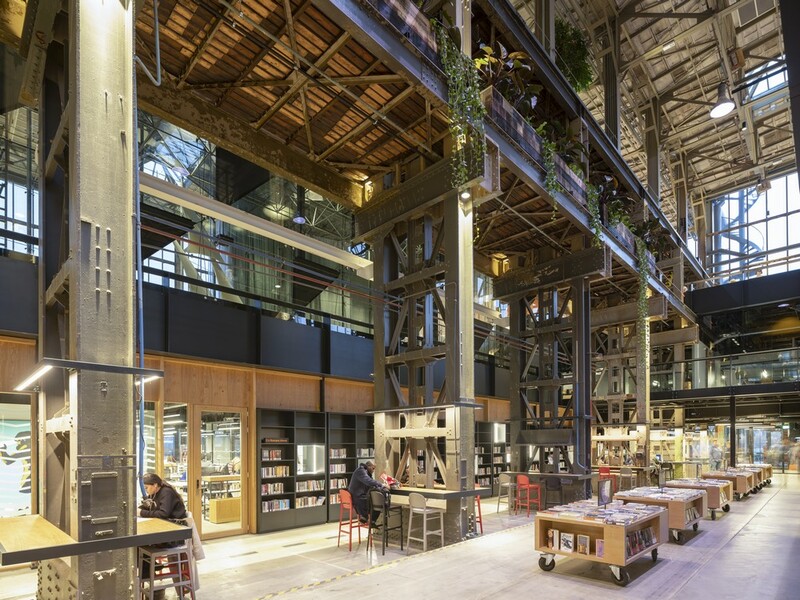 We design libraries, bridges, theatres, concert halls, art galleries, museums, civic buildings, squares, schools, residential complexes, sculptures and stations. We believe that architecture is a public interest. 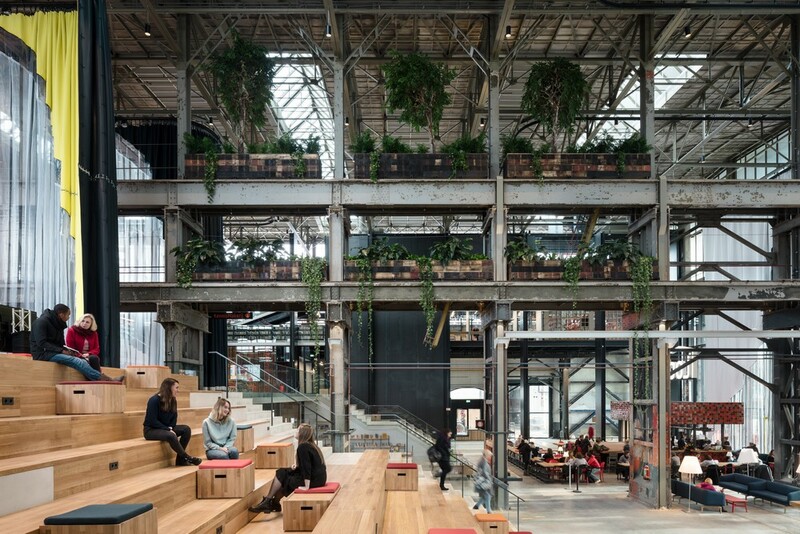 All buildings form part of the human environment in which people live, work and interact. Our designs therefore respect and anticipate social, cultural, economic and ecological requirements. 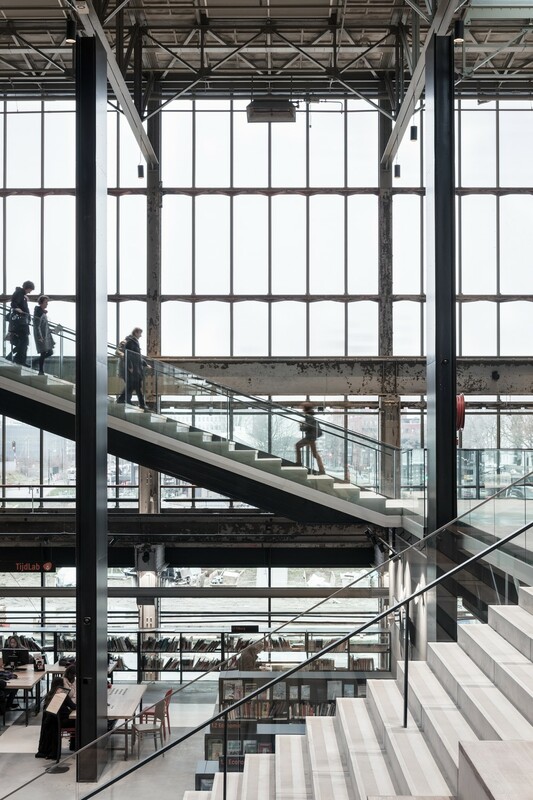 Civic currently has a staff of ten architects led by four managing partners. We approach each design on various levels of scale and always work with and alongside the best specialists. The result is functional and aesthetically responsible architecture which will serve the needs of generations to come. 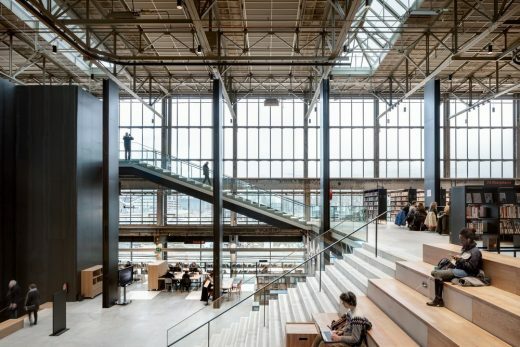 Braaksma & Roos Architectenbureau is a leading expert in the repurposing of unique industrial heritage. For over 35 years, we have dedicated ourselves to complex transformation and renovation projects in which we incorporate appropriate contemporary design elements. 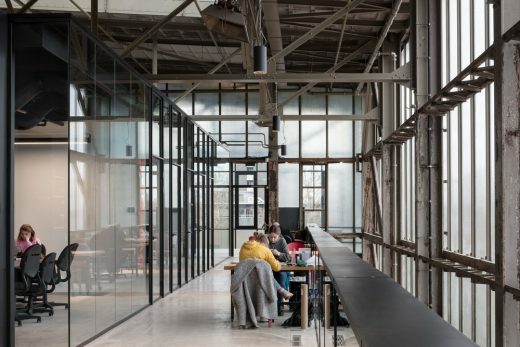 Based on an in-depth understanding of the unique characteristics of each building or site, our team seeks creative, sometimes surprising, solutions. We therefore create the optimum balance between the values of the past and the requirements of the future to ensure meaningful and sustainable usage. Inside Outside/Petra Blaisse is a multidisciplinary design agency founded by Petra Blaisse in 1991. It specializes in interior and landscape architecture and has extensive experience in exhibition design. Petra Blaisse has been involved in in designing architectural exhibitions since 1987 and is well known for her use of large-scale textile screens in public buildings, art installations and – on occasion – private homes. Inside Outside has an international client base. 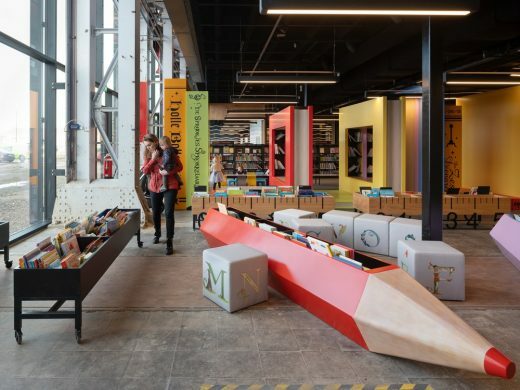 Alongside its design activities, it also runs lectures and workshops for students at home and abroad. Two partners joined the firm in 2016: landscape architect Jana Crepon and architect Aura Luz Melis. Programme: Mecanoo was responsible for the interior design of the Bibliotheek Midden-Brabant, Kunstloc Brabant and Brabant C in a former locomotive hall of the Dutch National Railways. 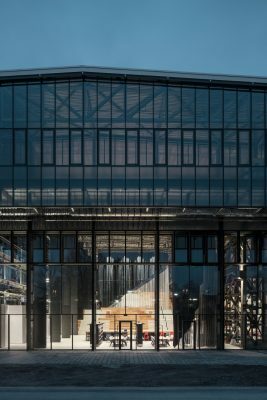 The interior design comprises 7,000 m2 including 1,300 sqm of offices.